Online resource to prepare PTE test! PTE (the Pearson Test of English) is an English exam for EFL (English as Foreign Language) persons. We assume that most of the website visitors know PTE quite well. If not, the brief introduction will help to get the big picture of PTE Test. PTE actually has 2 different examinations: PTE Academic and PTE General. PTE Academic is to evaluate the level of EFL students to learn college program in English speaking countries. PTE Academic is a common option of education organizations to test whether EFL students are ready to enter the English-speaking academia environment. Thousands of universities and colleges accept PTE score for admissions, including Harvard and Yale; meanwhile, UK and Australian Governments accept it for visa applications. PTE General, formerly known as the London Tests of English, is an exam designed for EFL persons who plan to live or work in English countries. It's a separate test, and is for immigration, not for academic purpose. PTE Academic test takers usually have heavier challenge, because they are supposed to listen to lectures and respond to questions in real campus life, or say, to be familiar with academic English. Besides, some of them want to get higher scores to apply for better universities. PTE test is leading computer-based test among all main English tests: convenient and fast. You may book a test, take it, and get its result to send to universities in 7 days. How do you do it? At first, schedule your test up to 24 hours in advance; then take part in a test session; and finally get the result within five business days. Thanks to the IT infrastructure, the computer-based test is available almost every day. PTE sets more than 200 test centres worldwide, which offer all services, for example, sending test score by request. Like all English exams, vocabulary skill plays a critical role to final score. If you are preparing to PTE exam, this website is right place for you. We understand that our visitors are in various levels, for separate expectations, and by different schedules. So we offer PTE exam takers a resources hub, not only one or few single word lists. These vocabularies, experiences, and apps will let you prepare PTE exam in easier and faster. PTE exam actually is English test. Vocabulary skill will impact all sections of the test. A PTE test taker usually tries to study a vocabulary to cover the words gap before test day; but the actual gaps are quite different among test takers. So, you may see many PTE vocabularies on Internet. Here we prepare 3 word lists and hope one of them can help you. For PTE test takers, to get a right word list is just the first step to build vocabulary. Learn new words and review known words are hard jobs day after day until test day. They usually try to look for some tools to improve performance and save time. The 4 web apps we introduce here are designed to address the puzzle. Through Internet and browser, you can enhance your PTE test vocabulary from every corner of the world. This web app has a built-in vocabulary of 1000+ words. If these words are matched with your level, the app definitely is a cool tool to help you to study and review them in the shortest time. It records your activities and words’ statuses, creates online exercises smartly, and pushes you forward on right way. Under this tool, every minute won't be wasted. This one month course is developed for hardworking and smart guys who are planning to complete 1000+ basic level PTE words. It sounds mission impossible for most of PTE test takers because 1000 words within one month is indeed a tough task for ESL (English as Second Language) students. However, if you try to challenge such a task, the web app gives you a chance. In case you don't finish course in 30 days for any reason, your efforts aren't wasted. The app is very flexible, you can extend your time frame to two, three, or even more months. Some PTE test takers are looking for a flexible vocabulary building tool. The basic idea is to load different word lists, even own word list, skip the known words, learn new words, and manage half-known words that need revisit periodically. VSO (Vocabulary Studying Online) is a perfect web app enclosing these features. In load web page, 3 popular PTE vocabularies are available to load based on your perference. In addition, you can load any other word lists. The app will get off most time-consuming overhead, and increase your performance dramatically. This website also collects and presents related materials, such as tips, experiences, and news, which may help students to prepare PTE test. Although we focus on PTE vocabulary build and the articles usually focus on vocabulary study, we also select materials of other PTE topics if we think that more or less our visitors are interested on them. These resources and information will help visitors go further and faster. PTE test consists of 4 sections: listening, reading, speaking and writing. When preparing PTE vocabulary, you should keep an eye on words in writing test especially. By the nature of writing, if you spell a word wrongly, which not only loses score directly but even ruins the whole sentence or paragraph. So we strongly suggest PTE test takers prepare a set of words for writing test, and ensure to use and spell them in correctly. This article lists some resources of PTE vocabulary spelling exercises. Do you want to print customized flashcards to prepare PTE vocabulary? This web site offers some tools to help you make own flashcards. Flashcards are common tool to memorize important stuffs, like math formula or foreign language words. Some students used to learn new words by flashcard since in elementary schools. When they start to build PTE vocabulary, flashcards would be one of the most usual tools. This paper will show how to print PTE flashcards with resources of this web site. Vocabulary level finally impacts the result of PTE exam, especially of PTE Academic exam. If you want to get a higher score to apply for better colleges, you must have stronger vocabulary. There are some efficient tools to enrich test vocabulary; and online exercise is one of them. This web site has 2 PTE academic word lists, which include single choice practice for each word. Based on them, you can take online single choice exercises to review the known word and learn new words. PDF file is a favorable option for many PTE vocabulary builders. However, how to make a personalized word list PDF puzzles some people more or less. The first thing is to have a base vocabulary that closes to your requirement, then remove known words or update whatever, finally produce your own PDF version by free online PDF makers. The paper will show you step by step. 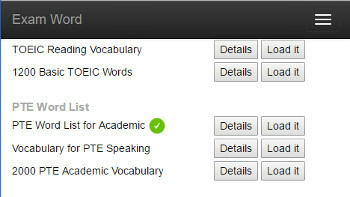 PTE Academic includes 4 sections: listening, reading, speaking and writing. As an academic English test, its contents are selected from real academic scenario, especially campus life, for example, excerpts of lectures, charts of either society or science. In listening materials, you will hear various accents, from British to India, to mock a diverse English academic environment. The test is aided with computer and headset.